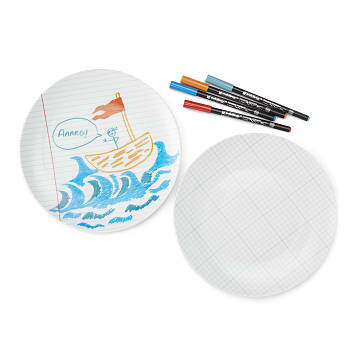 These playful dishes, printed like ruled and graph paper, come with four markers for doodling on them. You may not be allowed to play with your food, but no one said anything about the dishes. Made to look like math and writing notebooks, this set of two plates comes with four markers for doodling like you were never allowed to in class. The ink won't set until placed in the oven (30 minutes at 300 degrees), so wipe it off with a damp cloth to edit your doodle masterpiece. Fun for kids, artists, geeks, and those who've always liked stretching the rules a little. Designed in the United Kingdom. Made in China.